This trailblazer has covet-worthy style. Those are words often used to describe Ruby Rose. Best known for her acting on the Netflix hit Orange is the New Black, Ruby is also known for her modeling, for her DJ career, and for being a television presenter in her native Australia. As the current face of Urban Decay Cosmetics, Ruby, with her androgynous style and outspokenness, has taken the world by storm. Her fame has allowed her to bring representation for the LGBT+ community and help the world understand issues like gender identity, sexuality, and mental illness a little better. 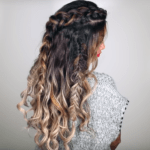 Ahead are some ways you can get Ruby’s bold style for yourself. Ruby’s style is masculine but she likes to add touches of punk and streetwear. 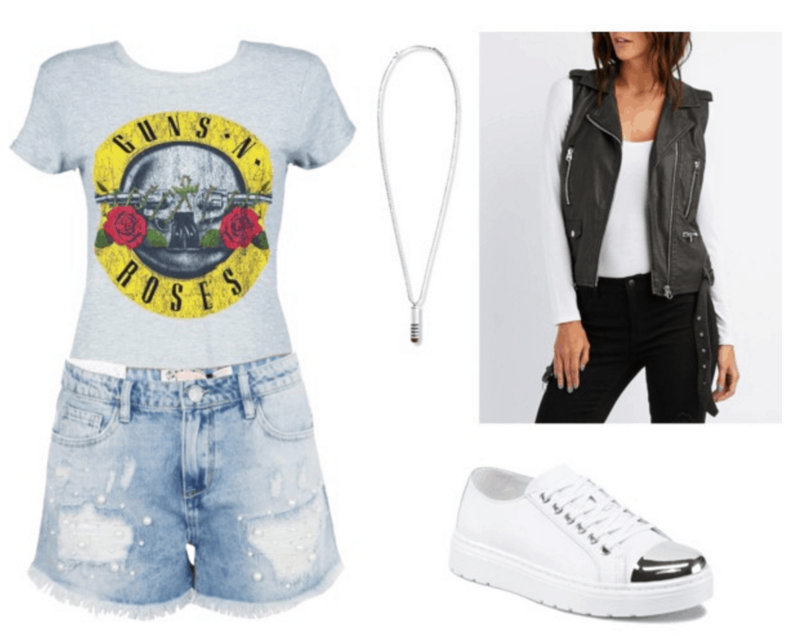 Get her look with a vintage band tee, loose (instead of fitted) distressed denim shorts and a leather vest. Add a badass touch to your look with a bullet pendant necklace. 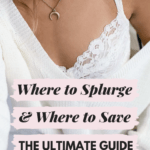 Top everything off with white metallic-toe sneakers as a nod to Ruby’s love of the shoe style – Ruby has this exact Dr. Martens style, and while it usually retails for $100, you can get it for $50 for a limited time! Just because it’s finals season doesn’t mean you can’t look cute. Inspired by Ruby’s off-duty style and love of jogger pants, this outfit is the perfect way to stay comfortable when you’re pulling all-nighters in the library. 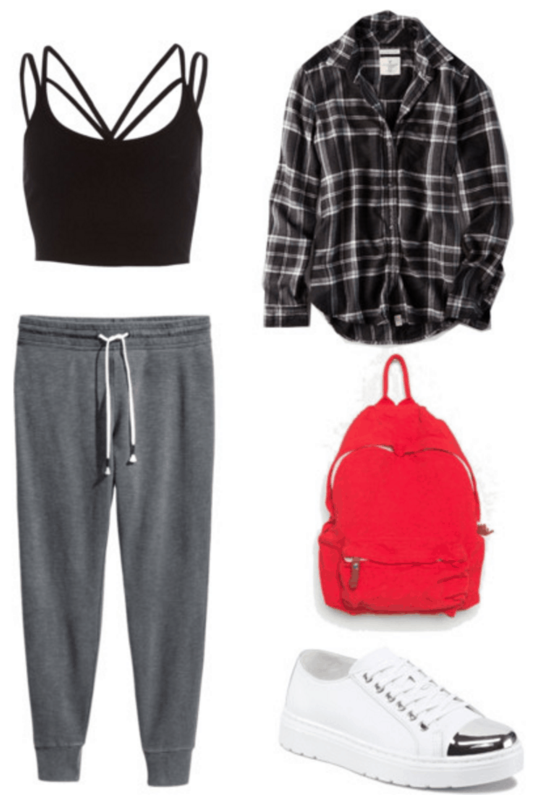 A strappy crop top and gray joggers are basic, but to elevate the look, top it with a soft flannel, a bright backpack for a pop of color, and trusty Dr. Martens sneakers. Although Ruby’s style is pretty laid back, she knows how to glam it up and steal the show. One of Ruby’s go-to looks on the red carpet is a tailored suit that still shows some skin. You can rock the same style for a date or your sorority’s formal. All black is demure and classic, but paired with a high-fashion faux fur purse, metallic heels, and edgy gold jewelry, the look will have you standing out in a sea of bodycon dresses. Are you a fan of Ruby Rose? Which of these outfits would you wear? Have anyone you want to see us cover? Let me know in the comments!